"Things are always better in the morning." — Harper Lee. This quote is in the masterpiece To Kill a Mockingbird and the treasured words of wisdom are as true now as they were when they were written. The Today Is Going To Be a Great Day Page-A-Day Calendar makes each morning better than the morning before. 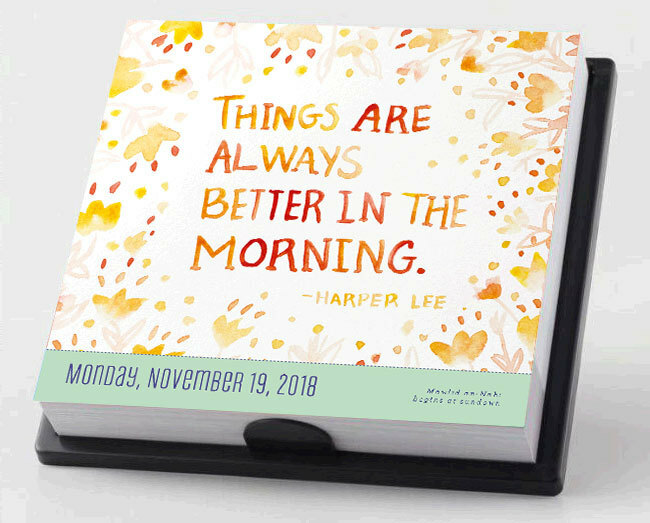 Harper Lee's quote is brought to life by the illustrative techniques of Satchel & Sage — the creative team of Austin, TX husband and wife Gerren and Morgana Lamson. The Lamsons make wood art, prints, stationary, textiles, and contribute to many illustration collections. Harper Lee isn't the only one who thinks of each morning as a fresh start. Here are other quotes celebrating the power of a new day. So whatever it is that's worrying you today, let it be. Sleep deeply. Because... "things are always better in the morning." Get inspired every day with Page-A-Day's inspirational calendars.